The US National Weather Service warns that even a 5-minute exposure to the cold could cause frostbite, while reports emerge that Apple knew of Facetime bug. As America’s midwest and north-eastern regions shiver under record-breaking cold temperatures and the wind-chill factor, Australia is reeling under sweltering weather never experienced before. Cold polar winds made it feel like the temperature dropped to -50 degrees Fahrenheit (-45.5 degrees Celsius) in North and South Dakota and northern Minnesota Tuesday morning, while in Illinois, the feel was between -30 and -40 degrees Fahrenheit (-34.4 to -40 degrees Celsius). The Great Lakes region in the far north, however, is under an even worse winter spell, with wind-chill predicted to be as low as -65 degrees Fahrenheit (-53.8 degrees Celsius), while the peaks of the north-eastern US feel like -73.3 degrees Fahrenheit (-58 degrees Celsius). Overall, around 25 million Americans are expected to experience actual temperatures below -20 degrees Fahrenheit, or nearly -29 degrees Celsius. 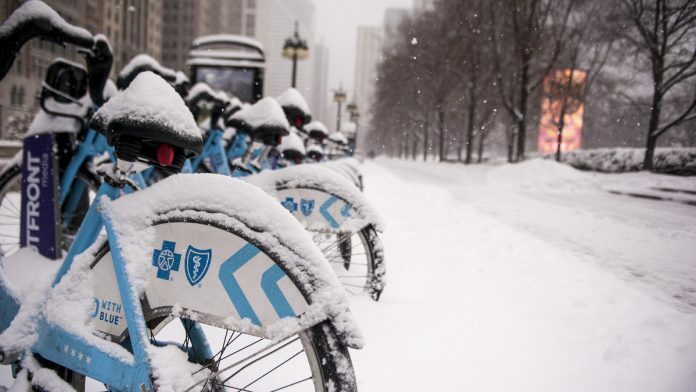 Chicago was reportedly colder than Antarctica Wednesday, as the mercury dipped to -24 degrees Fahrenheit. It is expected to sink to break the record low of -27 degrees Fahrenheit (set on 20 January 1985) over the next couple of days, with reports stating that five buses would be sent out to tour the city’s streets to act as mobile warming centres for its homeless. Classes for all 3.6 lakh students in Chicago were cancelled Wednesday, and many colleges in the midwest have also followed suit. The US’s National Weather Service has warned that just five minutes of exposure to the dangerous weather could result in frostbite. The weather has so far claimed one life in Minnesota, where an emergency has already been declared, schools have been shut and over a 1,000 flights have been cancelled. Experts say the polar vortex is responsible for this extreme weather—according to the National Weather Service, it is “a large area of low pressure and cold air surrounding both of the Earth’s poles” that “helps keep colder air near the Poles”. During winter, the polar vortex expands and pushes cold air southward with jet streams (strong winds blowing from west to east, a few miles above the Earth’s surface). And reports say that there is increasing evidence that suggests that the polar vortex is appearing more frequently outside the Arctic. In winters, America receives large outbreaks of the Arctic air. Meanwhile, in Australia, the temperature in Adelaide, at 46.6 deg C Tuesday, shattered an 80-year record. Severe power outages, burning of 50 wildfires on the island of Tasmania and wild horses being found dead are only some of the effects of the heatwaves that have swept parts of Australia. “A stagnant area of high pressure situated over southern Australia means sinking, warming air and dry conditions,” said a report in Forbes. Authorities have resorted to slowing and cancelling trams so that they can save power. The power situation has been exacerbated by the excessive use of air-conditioners. This week, Apple users reported a serious bug in the company’s video chat service, FaceTime, where users could eavesdrop or even watch the person they are calling even before the call is answered. The problem was triggered when a third person was added to a FaceTime call by the initial caller. The issue has sparked widespread security concerns. The company has disabled the option of group chatting on FaceTime and said Monday that it is “aware of this issue”, and that “we have identified a fix that will be released in a software update later this week”. But the real catch is the news emerging that Apple was aware of this problem more than a week back, but only started taking steps to correct its bug now. The bug, it appears, was first noticed by a 14-year old boy in Arizona on 19 January. His mother Michelle Thompson reported the issue the next day itself about a “major security flaw” that had the potential of exposing iPhone users to eavesdropping. But when neither the Apple Support team nor the security team responded to her complaint, the woman decided to disclose this incident on Facebook and Twitter. Apple reacted only when another complaint arrived in the form of an article that went viral on 9to5mac.com, Apple’s fan site. A report in The New York Times said that “a bug this easy to exploit is every company’s worst security nightmare and every spy agency, cybercriminal and stalker’s dream”. The report cited Adriel Desautels, chief executive of a company that assists firms in protecting their software, as saying that bugs, which have a market value of $2 million or more and which cannot be traced on the black market, work more than 99.5 per cent of the time.